Joan Walker’s research focus is behavioral modeling, with an expertise in discrete choice analysis and travel behavior. She works to improve the models that are used for transportation planning, policy, and operations. 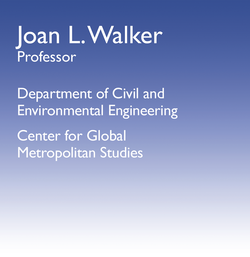 Professor Walker joined UC Berkeley in 2008 as faculty in the Department of Civil and Environmental Engineering and a member of the interdisciplinary Global Metropolitan Studies (GMS) initiative. She received her Bachelor's degree in Civil Engineering from UC Berkeley and her Master's and PhD degrees in Civil and Environmental Engineering from MIT. Prior to joining UC Berkeley, she was Director of Demand Modeling at Caliper Corporation and an Assistant Professor of Geography and Environment at Boston University. She is a recipient of the Presidential Early Career Award for Scientists and Engineers (PECASE) – the highest honor bestowed by the U.S. government on scientists and engineers beginning their independent careers. She is the current Chair of the Committee on Transportation Demand Forecasting (ADB40) for the Transportation Research Board of the National Academies. She has served as Acting Director of UC Berkeley's Institute of Transportation Studies (ITS) and as Co-Director of GMS.